Do you ever wonder about the hills that create so much beauty in and near Los Gatos? Here’s a Los Gatos terrain map (also called an elevation map) that you can play with – zoom in and out, scroll around the valley and generally investigate the varying hills, valleys, and elevations in Silicon Valley. 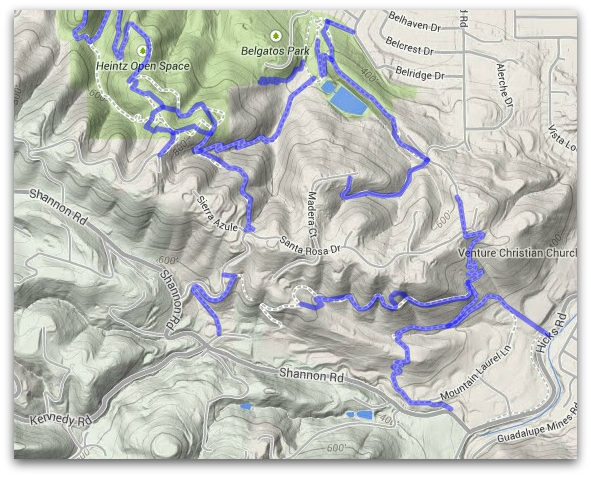 It is a fun way to check out the altitude or grade of hills. Coming soon – info on the Shannon Valley Ranch neighborhood. For now, though, here are some photos of the Shannon Valley open space and trail – a lovely area with fantastic views. These photos date back almost two years, to January 2013 (a dry, pleasant winter day!) so views of the housing that was going in then will be quite different looking now. On the right: in the distance, see the Guadalupe Landfill, also known simply as “the dump” locally, which is accessed off of Guadalupe Mines Road. Below it , see the Brookside Development in Almaden (with Los Gatos schools) getting ready for building. Those homes are in now – at least many are! Same photo – The Shannon Valley Ranch neighborhood is off to the right, in Los Gatos at the far eastern edge. 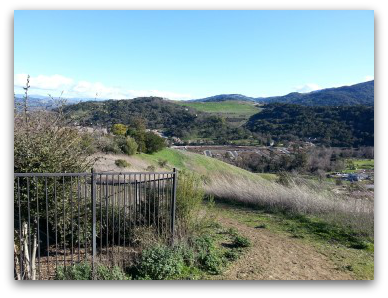 The dividing line between Almaden and Los Gatos is the Guadalupe Creek – though the school district does not stop at the creek boundary, oddly enough. 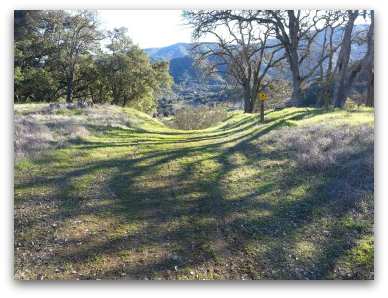 The next image, seen on the left, is of the Shannon Valley Ranch Open Space Trail. 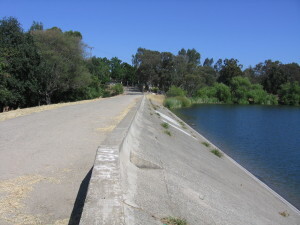 This connects to a network of trails in east Los Gatos though you have to cross Santa Rosa Drive to go from one to the next. 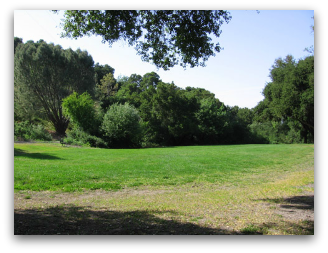 Even so, from here you can reach the Santa Rosa Open Space, Heinz Open Space, and also Belgatos Park trails – whether you are walking, mountain biking, or riding horseback, it’s possible to go and go with only a very short patch on asphalt as you traverse Santa Rosa Drive. The views are gorgeous from the Shannon Open Space trails, which is situated on the back side of Blossom Hill (the actual hill, not the road). Looking across, you see the coastal foothills and local landmarks such as Loma Prieta. 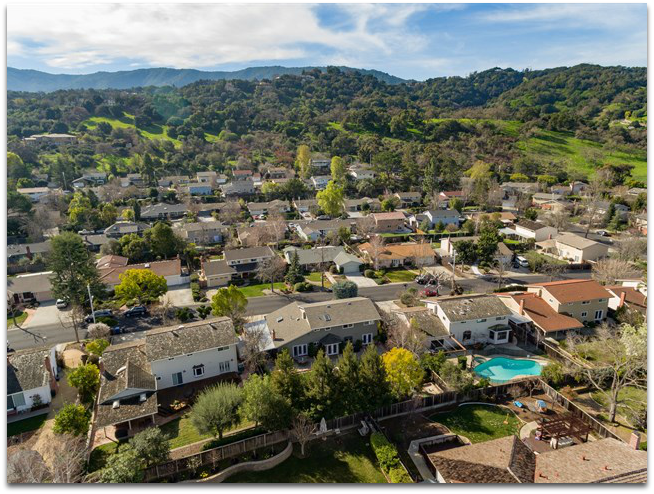 To the east, you can enjoy views of Almaden and the east foothills, depending on your vantage point. The hill is not too steep – though I’m the first to admit that I’d rather be walking down than up! Something to be aware of is that with all this open space there also comes wildlife such as coyotes, bobcats, deer, mountain lions, skunks, possums, racoons, rats, mice and snakes. Rattlesnakes are indigenous to this area and they sometimes like to come out on the trails to sun themselves, so please be careful when walking, running, or hiking or otherwise moving across these spaces. You don’t want to find a rattler with your foot! Here’s a sign that I found both disturbing and amusing regarding the presence of snakes (and also who’s got the right of way on the trail). 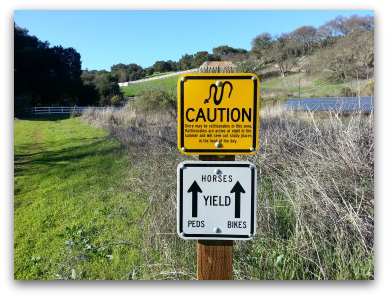 I never knew who was supposed to yield to whom vis-a-vis horses, pedestrians and bicyclists – did you? But according to this sign, folks riding horseback are to give way to those on foot or bikes. This upcoming winter it is expected (and frankly, after the prolonged drought, HOPED) that we will have an El Nino year with abundant rain. If you have never been out to the Shannon Valley Open Space area – do it sooner rather than later. My better half, Jim Handy, used to be a volunteer Los Gatos Parks Commissioner (for about 7 years) and he created a map of the trails which you can see on Google for this part of town. Here’s the link to the Shannon Open Space and nearby trail areas. But do watch for snakes! 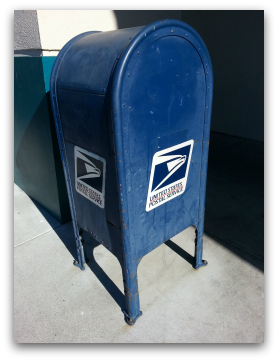 Where can you find a blue USPS mailbox in Los Gatos or Monte Sereno? Have you ever needed to mail something but just did not have the time to run to the main post office? Sometimes those blue United States Postal Service mailboxes are just the thing you need. But try finding one if you are stressed or in a hurry and cannot think straight! Available for both iPhone and Android smart phones, Mail Box Locator is a free app which will assist you in discovering the box in closest proximity to you. (Find it on iTunes or Google Play.) Ont the Google Play site, it’s given about 3 1/2 stars out of five. Regular websites may be preferable. Browsing the web, are a few sites for finding the nearest blue collection box. One is Mailbox Map. Something cool about Mailbox Map is that it allows users to add maps, which should help to keep it current. (Though I believe it’s more likely for boxes to be removed than added with current budget constraints.) Mailbox Map uses cute mini blue box icons for its markers – see image below. I found another site, also not affiliated with the USPS, which offers a couple of ways of locating those blue collection boxes – by list or by geo mash up map. (Apparently the website began as a way of finding public pay phones, but it covers these ubiquitous blue boxes as well). They do, of course, include the actual post office locations as well. What the maps and lists don’t do is combine zip codes. Sometimes you’re on the border of two zip codes and it would be ideal to simply put in your own address and see what’s nearby rather than searching only by zip. 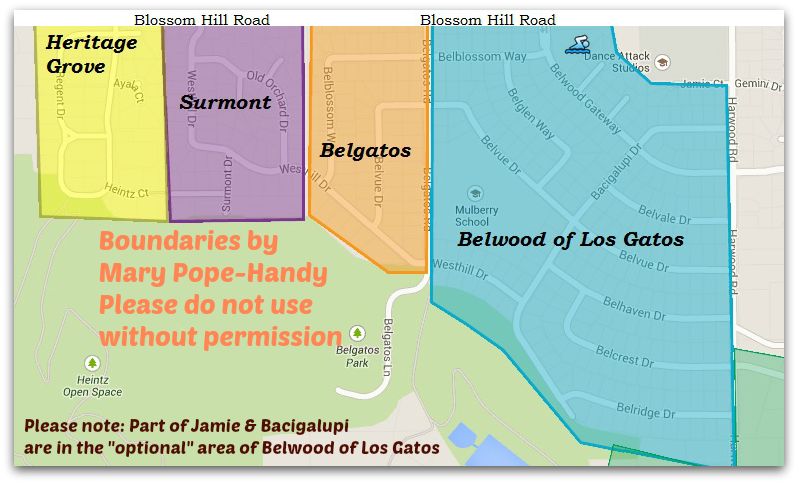 Below are links to that information by our three Los Gatos and Monte Sereno area zip codes, 95030, 95032, 95033. Too often, we think that the search engines know it all, and that includes the maps and names for neighborhoods or subdivisions and where they’re located. Real estate agents or Los Gatos Realtors who want to get ahead sometimes begin by using Bing maps (since Bing has been volunteering subdivision names for awhile now) and create searches of homes for sale based on them, and articles reliant on these mislabeled maps, so getting it all wrong. 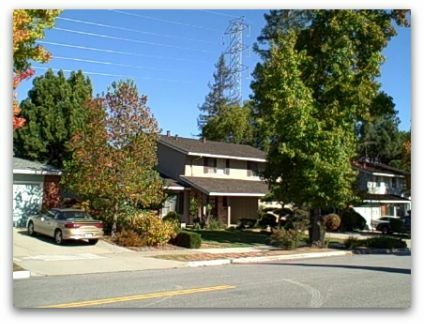 Surmont and Heritage Grove in east Los Gatos are prime examples! 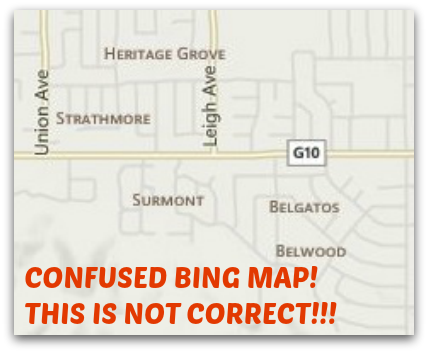 Bing has Heritage Grove north of Blossom Hill Road and set between Leigh and Union. It has Surmont spanning both where it belongs and where Heritage Grove actually sits. Bing doesn’t know what to do with Belgatos and Belwood, so put one slightly north of the other. For the record, I did submit a “ticket” to Bing to alert the good folks there to the problem. Not a peep back so far, though. 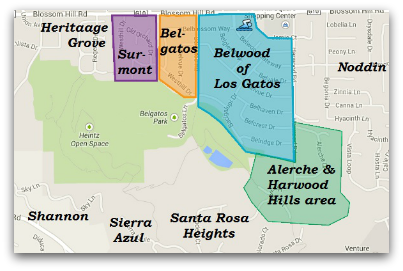 The divider between Belwood of Los Gatos and the Belgatos area is Belgatos Road (think east-west, not north-south). Surmont is to the west of them…but only the area which is contiguous with Belgatos and Belwood. The part that isn’t contiguous (that you have to reach via Blossom Hill Road) is the much, much younger Heritage Grove. I mapped it out myself based on plat maps from preliminary title reports. I know it’s not elegant looking but it is pretty accurate overall. Sometimes it is really not clear where one subdivision or neighborhood ends and another begins. That’s when it is especially handy to be able to look at a plat map, which sets forth all kinds of very cool information. Have you ever tried to figure out the Los Gatos zip codes? The only easy one is 95031, and that refers to PO boxes only! 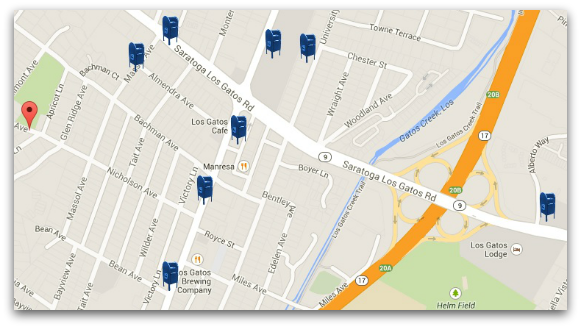 To the left, please see a map of the Los Gatos zip codes*: 95030, 95032 and 95033. 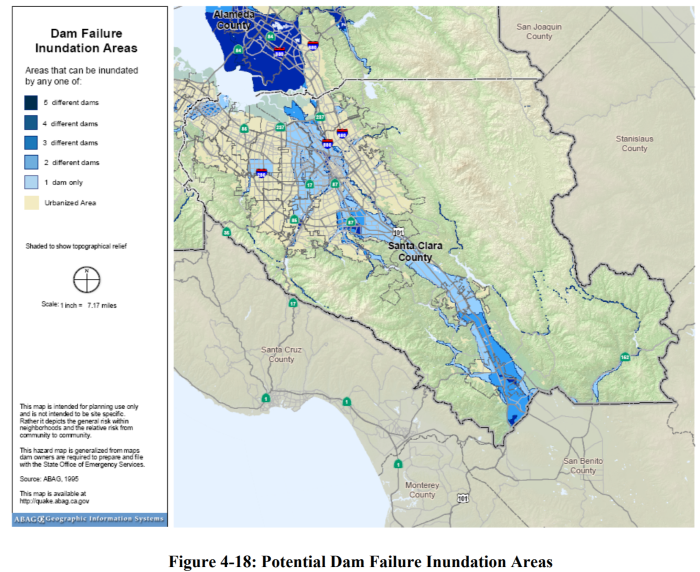 The large area is the 95033 or “Los Gatos Mountains” area. Just above it is 95030 and above that is 95032. 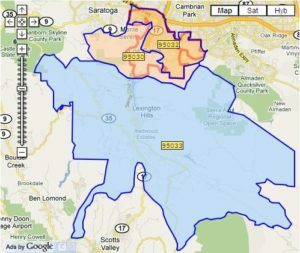 Los Gatos Zip Code commentary: A few years back, the post office reorganized the way that 95030 and 95032 split up most of the 9 or 10 square miles which comprise the “town of Los Gatos”. It used to be an east-west divide, and now it’s closer to a north and south split, but not exactly that either. I love this map because it looks as odd as the new distribution feels! The 95033 zip code is unincorporated, mostly in Santa Clara County, but as you can see, much of it falls west of highway 35 (Skyline Blvd) and is in Santa Cruz County. When a home has the 95033 zip code, it is analogous to the property being “in the mountains”. 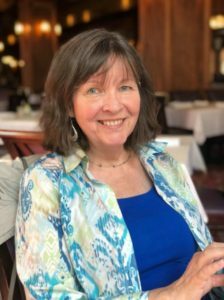 (2) There are some funky pockets near the town’s borders where the homes may actually belong to Los Gatos but have a zip code of the neighboring community or vice versa – this is rare, but it happens. A patch of Campbell near Pollard and Quito has a Los Gatos 95032 mailing address, but it’s actually Campbell. Another pocket of Los Gatos near National and Carlton has a mailing address of San Jose 95124, but it’s actually part of the town of Los Gatos. Weird, but true.